We all know that one of the indicators of the stock market price is the NEWS that is being discussed on a particular day. A good news might make the stock market price higher while the bad NEWS might make the stock price lower. An investors increases his investment as long as he found out that the company is in a good position because he is increasing his trust in the company. As an example, a news about an accident happened in a Mining area will definitely affect the stock price of a particular mining company. A change in the Board of Director also affects the price of a stock market either positive or negative. Today, I will teach on how to be updated on the news that floats around the internet about your chosen company. 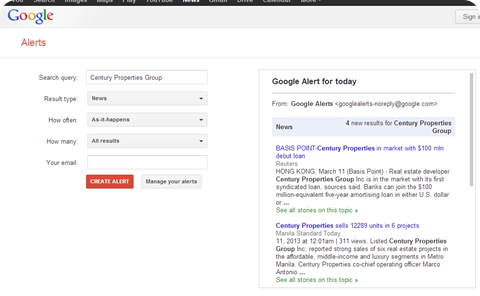 As an example if you want to be updated on what is going on at Century Properties Group (CPG), you may create a Google Alert for all the news that is being posted in the internet. 1.) 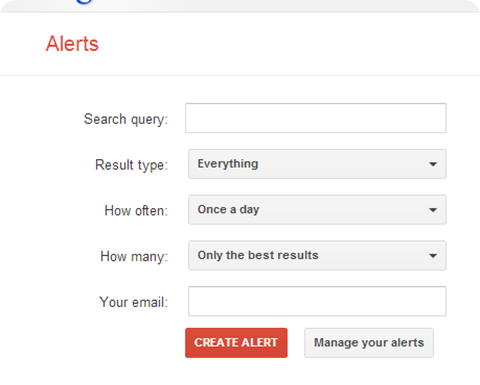 Go at the Google Alert site (http://www.google.com/alerts ) and fill up the required data where you want to be updated. 3.) At the result type you may choose to be informed from News, Blogs, Videos, Discussions and Book. Most of the time I choose News, You may also create additional alert from Blogs. 4.) In the How Often Space: You may choose from as it happen, once a day or once a week. Most of the time I choose “As it Happen”, so that I am informed of any choose or blogs being posted in the internet. In addition you might want to be part of different Facebook Group, where information is always updated from different helpful members. This might not be important for long term investors, but I do believe that it is always nice to be informed about the things happening at your stocks portfolio. If you found it useful you might want to share to your friends and FB groups. 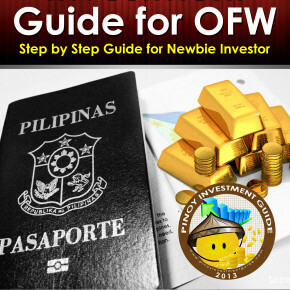 Previous postHow to Add Funds to Your Stock Broker? Next postRed Market Last Week, Is Your Investment Affected?